Kodak Building 9 interior photographed. The Kodak recreation building, (officially known as Kodak Building 9) was moved from its foundations last summer. The idea was to create new foundations that the building will return to and become part of the new Mount Dennis Station. Kodak Building 9 interior. From Crosstown LRT Twitter. Click for larger image. It was recently photographed and the worker inside illustrates the awesome size of the building while graffiti still festoons the interior walls. Read more about last summer’s move here. Work on Kodak lands continues this year. 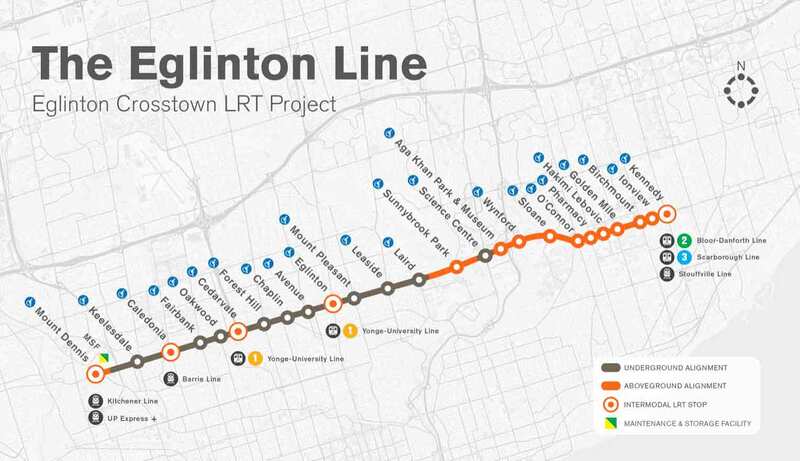 An interesting article in railwayage.com summarizes the progress expected this year on the Eglinton Crosstown line. Apparently the first track to be installed will go on the Kodak lands later this year as part of the rail yard that will be built there. The line is scheduled to be in service by 2021. 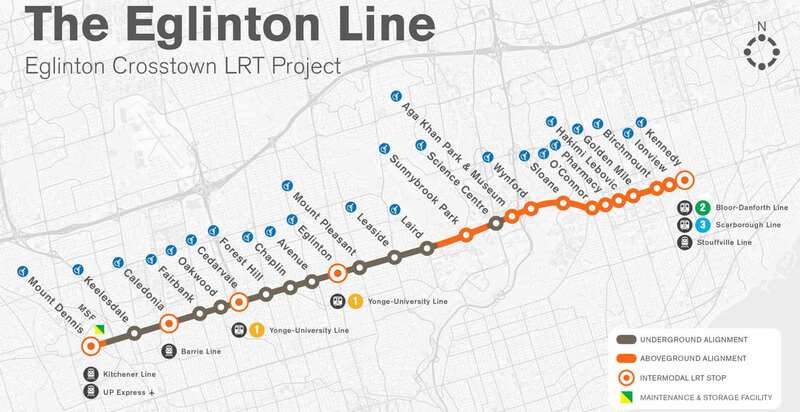 The total cost of the 19 km, 25 station partially (10 km) underground line is estimated to be $6.6B and is a relative steal compared to the $3.2B estimated cost of the one-station Scarborough Subway extension. Incidentally, our mayor and councillor seem bound and determined to push forward with the Scarborough folly and have rejected a fully-funded seven station LRT. These are the people who successfully voted against basing transit decisions on data. They didn’t want ranked balloting either. I wonder why. Urban Toronto describes itself as, “Toronto’s premier website focused on condos, architecture, urban development and real estate.” It is read by many in the industry. There is a recent article in the U.T. site that details future development projects in our area. 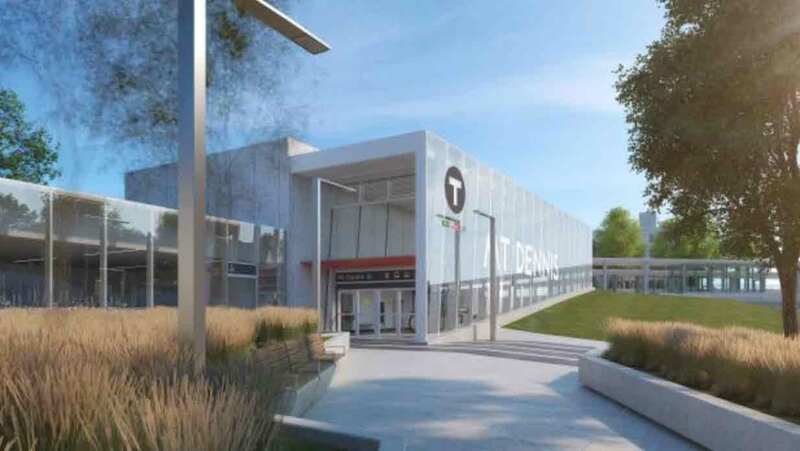 They believe that the driver of this new activity may be the Eglinton Crosstown LRT with the possibility of a future connection to Pearson Airport. Steve Munro is a tireless blogger who is an authoritative voice on transit and politics in the GTA. He recently posted an article about the proposed Mount Dennis generator and some interesting points have emerged in his article and also in the comments section. As an aside, comments sections are IMHO as interesting and sometimes as informative as the articles to which they are attached. Readers are no doubt aware that late last year, Metrolinx and its partner Crosslinx Transit Solutions proposed that an 18MW gas-powered generator be built to supply electricity in the extremely rare event of a Toronto Hydro outage. Later proposals designed to soften the blow claimed that heat could be recovered from the generator and used for heating purposes. Steve maintains that the heat recovery idea could only be useful if the generator was operating regularly rather than the claimed (by Metrolinx) use as a standby. Also, according to Metrolinx, only one of the 6 generators would be used for heat recovery while the other 5 would be untouched. An alternative (to the gas powered generator) would have to provide the same basic functional requirements as the proposed natural gas powered facility. The gas-powered facility was proposed in order to provide the ability to maintain service when the power goes out and improve transit resilience, lower the cost of power by eliminating any contribution to peak power demand from the new system, and ensuring it does not contribute to the need for more transmission or generation infrastructure. Steve notes that there are several electric train systems coming on line and Metrolinx stated that there is already an ample electrical supply for these trains. He concludes that the main goal of the generator is to reduce electricity costs rather than provide an emergency backup. In the comments, one reader suggests that in a true emergency, gas supply is only guaranteed for 3 hours. Another points out that the natural gas supply relies on line pumps which need electricity from the grid. Yet another states that running the whole line from one generator is impractical because of the voltage drop that would occur over the 19km length of the Crosstown Line. Apparently the generating system at Pearson Airport sells power to the grid at peak times and this income pays for its operating and maintenance costs. The generator is fired up every week to ensure that it is reliable (i.e. at least 52 days a year) and supplies the airport with power on those days. Because the airport covers a relatively small area, transmission losses are minimal (unlike along a 19km transit line). Incidentally, the last time power was knocked out to Terminals One and Three back in February, the emergency system failed to operate, leaving much of Pearson in the dark. Read Steve Munro’s article here. 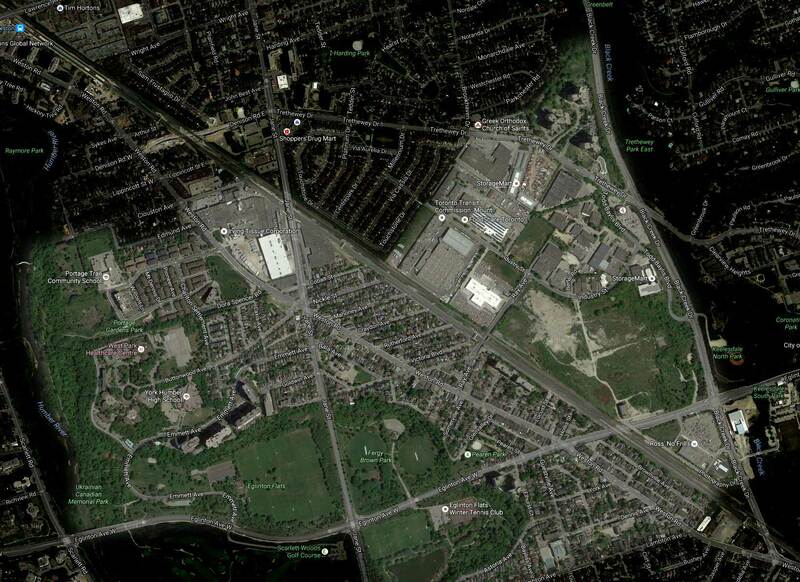 The original intent behind agreeing to make Mount Dennis a net-zero energy community may have been to act as a way of compensating for a seemingly grim determination on the part of Metrolinx and Crosslinx Transit Solutions to build an 18MW gas fired power station on the Kodak Lands in Mount Dennis. As reported here in July, Fernando Carou, the City’s Senior Engineer from Community Energy Planning Environment & Energy Division quietly conceded that the generator was dead. The generator, suddenly sprung on the community last year was to be located on the Kodak lands at the corner of Ray Avenue and the railway right of way. A strong and effective community response totally rejected it. Yesterday there was another confirmation that the power plant is still dead from none other than Councillor Frances Nunziata in an InsideToronto article. In it she states her confidence that the generator will be scrapped and replaced with a greener alternative. The article goes on to say that according to Metrolinx chair Bruce McCuaig, a source of back-up power is still needed but it won’t be gas powered. The extra energy will get trains out of tunnels during a power failure. The gas generator would have made electricity in times of peak demand such as during very hot or cold weather and sold it to the grid at a premium. The City’s Mr Carou was enlisted to come up with a ‘Community Energy Plan‘ that would outline ways of offsetting the pollution created by the generator with a more energy efficient community. As written, the Plan, still in draft form seems hastily produced judging by the typo’s, grocers’ apostrophes and less helpfully, undefined acronyms. It details how a portion of Mount Dennis will become much more energy efficient (net zero) through a variety of strategies. The area in daylight will become energy neutral under the plan (click to enlarge). Adapted from Google. The area is quite large and diverse with schools, stores, factories, West Park Hospital and a variety of housing types. It does not include the long awaited community centre, nor for some strange reason, houses on the north side of Edmund Avenue. Under the plan, apartment landlords, condo corporations and homeowners will be encouraged to make use of the various City incentives to save energy. Energy saving suggestions include replacing incandescents with compact fluorescent bulbs. Curiously, LED bulbs aren’t given a mention. Apartment building tips include installing heat exchangers, lowering lighting levels in common areas, using low-flow shower heads and turning off the heat in underground garages. Some of the savings calculations seem a bit off. For example the report claims that putting apartments on individual electric meters would save 1.3% but in a recent Star article Navigant Consulting says electrical consumption would fall by 27% in buildings heated by electricity and 34% in gas heated buildings. Other ideas include extracting heat from trunk sewer lines using a heat pump system and capturing waste heat from the (still dead) gas powered generator itself. These, while interesting ideas would be expensive. Since most of the ideas would be effective in reducing the carbon footprint of any community, it’s hard to know what exactly would be different for Mount Dennis. After all, the City is encouraging adoption of these measures in every neighbourhood. Low interest loans for things like energy efficient furnaces, better insulation and low-flow toilets are already available to landlords, businesses and homeowners throughout the city – repayable through City property tax bills. Any neighbourhood can and should adopt many of the more effective measures. The idea of making Mount Dennis a net zero community is a great one that emerged as a result of a spirited opposition to the generator from a variety of community groups. The task will be hard as there are some huge emitters that will need to be tamed. West Park Hospital for example has plans to open a new hospital on its existing site. Both the old and new locations will need a thorough review. Once the bus station opens on the Kodak Lands site, diesel buses will be idling in hot and cold weather. Existing factories such as Irving Tissue (Toronto Hydro’s second largest customer) may be reluctant to come on board. The draft Plan doesn’t attempt to justify the gas plant itself but dismisses low-carbon alternatives as ‘prohibitively expensive’. It will be interesting to see what Metrolinx comes up with although Bruce McCuaig was vague about timing. In the meantime, thanks to solid citizen involvement, Mount Dennis will get the chance to reinvent itself as a net zero community.